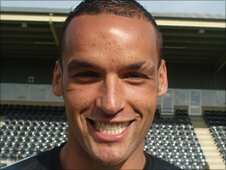 Cheltenham Town have signed striker Kaid Mohamed on a two-year contract until the summer of 2013. The 26-year-old, who has also had spells at Forest Green and Bath, joins after being released by AFC Wimbledon. Mohamed told BBC Gloucestershire: "I spoke to the gaffer [Mark Yates] at the end of [the 2009/10] season with Bath and he was interested in me. "I snapped up the chance so I'm looking forward to doing well and hopefully scoring some goals in League Two." Mohamed's most successful time in his career so far came at Bath, where he scored 26 goals in 65 games, playing all positions across the frontline. He left to help AFC Wimbledon with their promotion push in to the Football League, scoring five goals in 10 matches. Yates added: "We've been after Kaid for a little while. We tried to get him in January. He'll excite the fans. "He's a good specimen of a lad, he's got physical strength, pace and power and it's something we needed to add to the squad. "I'm delighted. It's taken a bit of time, there's been a few clubs in for him. "He'll be a good asset for us in any of the four attacking positions."